The North East Atlantic includes a diverse range of environmental conditions and different ecosystems. These play a key role in the types and patterns of human activities in the OSPAR maritime area and associated pressures on the marine environment. The OSPAR Maritime Area provides the basis for a wide range of goods and services including food, transport, energy and amenities for millions of people. Maritime activities are important for the economies of the OSPAR Contracting Parties in terms of gross value added and employment. Many of the activities are expected to increase in the future and new activities will emerge. The consequences of these activities for the marine ecosystem can lead to direct costs for society. On the other hand, many activities directly depend on a good condition of marine waters. While OSPAR has a long history in assessing the state of the marine environment and the pressures from human activities affecting it, OSPAR has only recently begun to work on economic and social analyses. Understanding the linkage between the health of the marine environment and human wellbeing can help support effective management of human activities and the sustainable use of the sea. 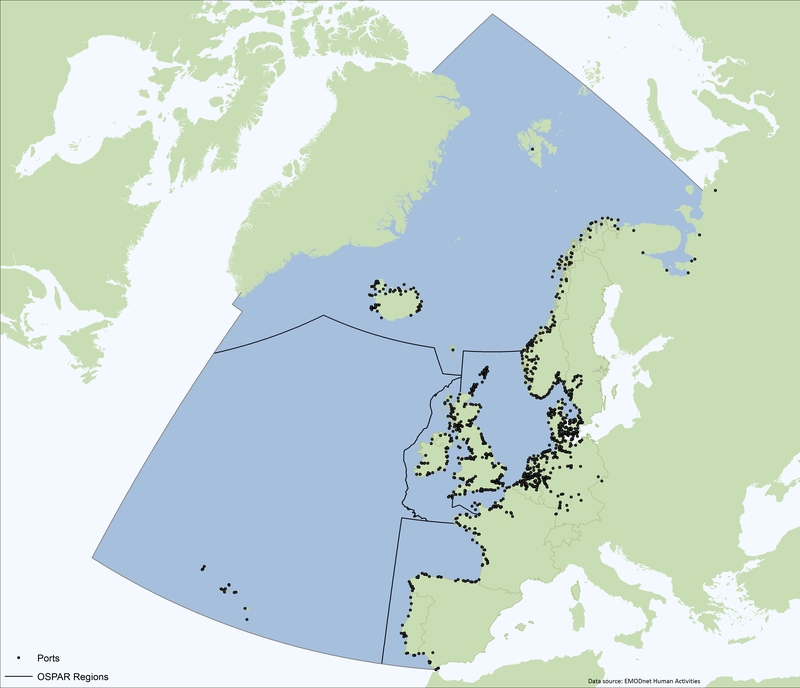 Under its North-East Atlantic Environment Strategy, OSPAR is developing and refining methodologies, including social and economic analysis of the uses of the OSPAR Maritime Area, to aid future evaluations of whether the North-East Atlantic is used sustainably. This OSPAR work also underpins a coordinated regional approach to economic and social analyses for the North-East Atlantic, which European Union Member States are required to deliver under the Marine Strategy Framework Directive. 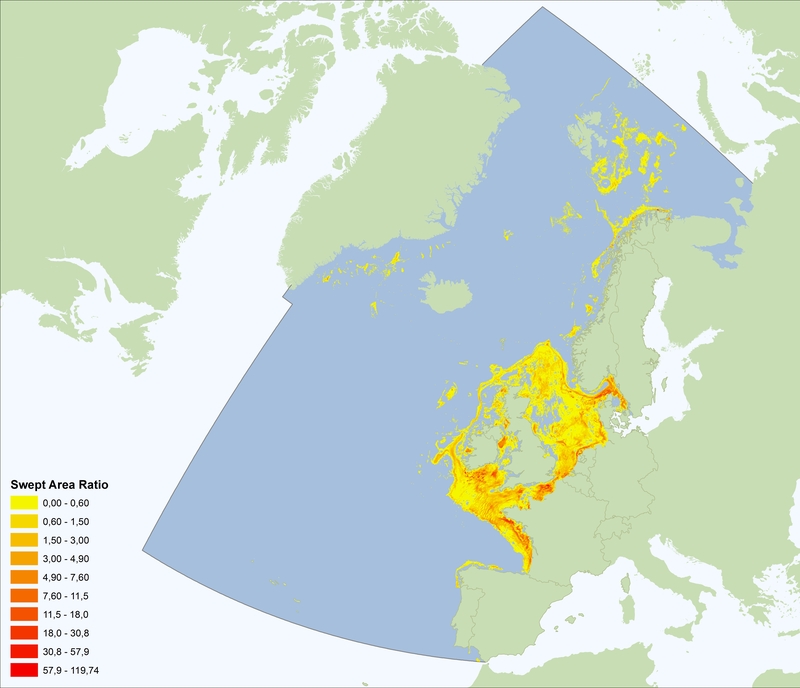 This chapter provides preliminary considerations of the methodology associated with assessing the economic and social value of the OSPAR Maritime Area and an initial regional indicator-based economic and social analysis of selected uses of the North-East Atlantic, supported by a description of their spatial distribution. In 2010, OSPAR undertook to develop a regional socio-economic analysis, in order to assist European Union (EU) Member States in a regionally coordinated approach when reporting their initial assessments under the EU Marine Strategy Framework Directive (MSFD) for the first time in 2012. The project resulted in a study which evaluated Contracting Parties’ methodological approaches; compiled and checked for comparability Contracting Parties’ economic and social data on the uses of the sea; and undertook a detailed evaluation of the sectors ‘ports and shipping’ and ‘leisure and tourism’. One of the key recommendations of the OSPAR study was that to undertake economic and social analysis for the OSPAR Maritime Area requires a degree of flexibility in order to accommodate the different economic and social priorities of the various Contracting Parties. This meant that the analysis of pressures and proposed management measures could differ at the country level. The report also recommended the need for economists to take an active in role in steering the work and facilitating data collection. The study also reviewed the differences and similarities in the economic analyses carried out by OSPAR countries noting that most countries largely presented the same type of data for the economic and social description of the use of the marine environment in their 2012 national assessments. For the analysis of both the cost of degradation of the marine environment and the ‘business-as-usual’ scenarios, a wider variety of methods were used. Building on the results of the OSPAR review, Contracting Parties have been working to facilitate more coherent economic and social analyses at the OSPAR level. As a first step and as a contribution to the Intermediate Assessment 2017, countries are working to align the collection of data for describing the uses of their marine waters. This includes the development of a minimum set of indicators for economic sectors that are relevant to all Contracting Parties, while leaving flexibility for additional national analyses. The minimum indicator set includes gross value added, employed persons, and development in production value. As a start, Contracting Parties have identified some common economic sectors for the analysis (fisheries and aquaculture, shipping, ports, oil and gas industry, and offshore wind energy). The selection is one of convenience reflecting the sectors for which data are available in most countries. The selection does not imply any ranking of importance of economic sectors, nor is a complete presentation of each individual sector intended. There are also sectors that are not included in the current analyses that are important users of the marine ecosystem but for which there are no uniform statistical data yet available, such as recreation and tourism. The analysis is (largely) based on statistical data, for which, to the extent possible an internationally agreed sector nomenclature is used based on the NACE classification (Nomenclature statistique des activités économiques dans la Communauté Européenne), a EU-wide classification scheme to exactly define sectors in statistical data. After this important first step, future assessments such as ‘business-as-usual scenarios’ can be undertaken. 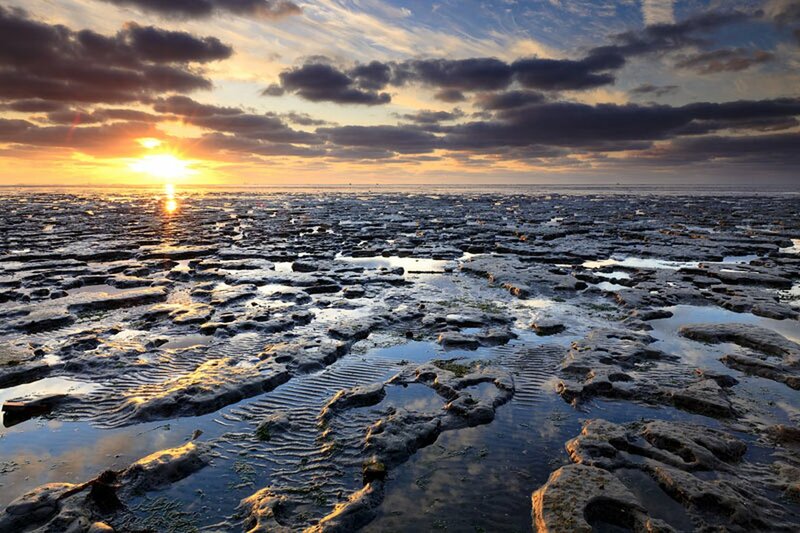 Uses of the sea put various pressures on marine ecosystems and can lead to the degradation of the marine environment and ultimately to the loss of marine ecosystems and their goods and services. 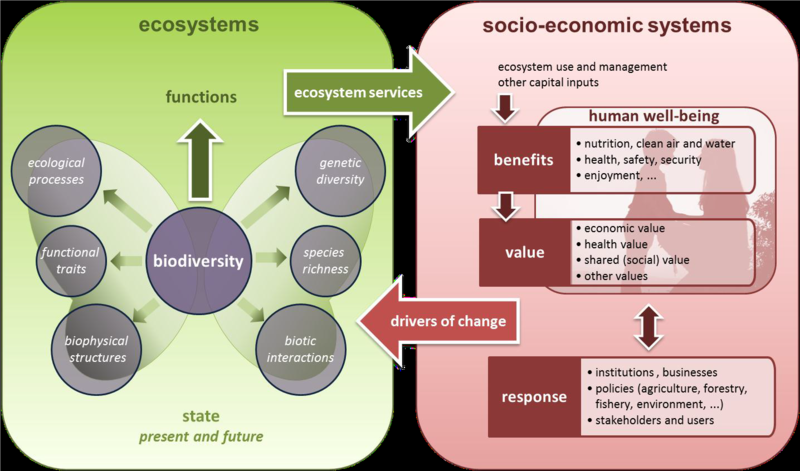 Ecosystem services are defined as the benefits that people obtain from ecosystems, and the direct and indirect contributions of ecosystems to human wellbeing (Grizzetti et al., 2016). In a simple description, the concept of ecosystem goods and services explains how economic and social welfare link with ecosystem health through the flow of goods (e.g. amount of fish) and pressures (e.g. loss of habitats) that affect ecosystems and their functioning (see Figure 1). An important driver for the implementation of the concept of ecosystem services is Action 5 of the EU Biodiversity Strategy, which foresees that Member States will, with the assistance of the European Commission, map and assess the state of ecosystems and their services in their national territory by 2014, assess the economic value of such services, and promote the integration of these values into accounting and reporting systems at EU and national level by 2020. In addition, OSPAR’s North East Atlantic Environment Strategy, which has implementing the ecosystem approach as one of its main objectives, is another driver for this work. The Strategy commits OSPAR countries to continue to progressively implement the Ecosystem Approach to the management of human activities in order to reduce impacts on the marine environment, taking into account all pressures from human activities on the marine environment. One of the main strategic directions under this objective is to develop methodologies, including social and economic analysis of the use of the OSPAR Maritime Area, to support evaluations of whether the North-East Atlantic Ocean is used sustainably. Ecosystem goods and services is one such approach that will need to be further developed in a regional context. Based on the DEVOTES project, as well as the INTERREG project VALMER, Börger et al. (2016) presented some interesting case studies on the use of ecosystem services in the marine environment (fisheries, marine protected areas, and underwater noise) that can be used as a source of inspiration for the continued work of OSPAR on socio-economic assessments. Key findings from the implementation of ecosystem services in relation to the EU Water Framework Directive will also be taken into account, such as from ESAWADI (Ecosystem Services Approach for Water Framework Directive Implementation). This section will be developed further in 2018. It is intended to present an economic and social analysis of selected sectors (fisheries and aquaculture, shipping, ports, oil and gas industry, and offshore wind energy) using selected indicators (gross value added, employed persons, and development in production value). It is intended to base the analysis on statistical data, using as far as possible the previously mentioned NACE classification. The data will be collected from Contracting Parties in 2018. A series of maps are used to describe the spatial distribution and intensity of selected uses: fisheries and aquaculture (Figure 2 and Figure 3), shipping (Figure 4), ports (Figure 5), oil and gas industry (Figure 6), and offshore wind energy (Figure 7). The maps are based on existing OSPAR data streams, and other sources where necessary and as identified. They help identify ‘hotspots’ of certain economic activities, which can be linked to potential environmental pressures. Fisheries operate across the entire OSPAR Maritime Area. Figure 2 illustrates seabed abrasion due to demersal fisheries, as an example of the spatial extent of this activity. 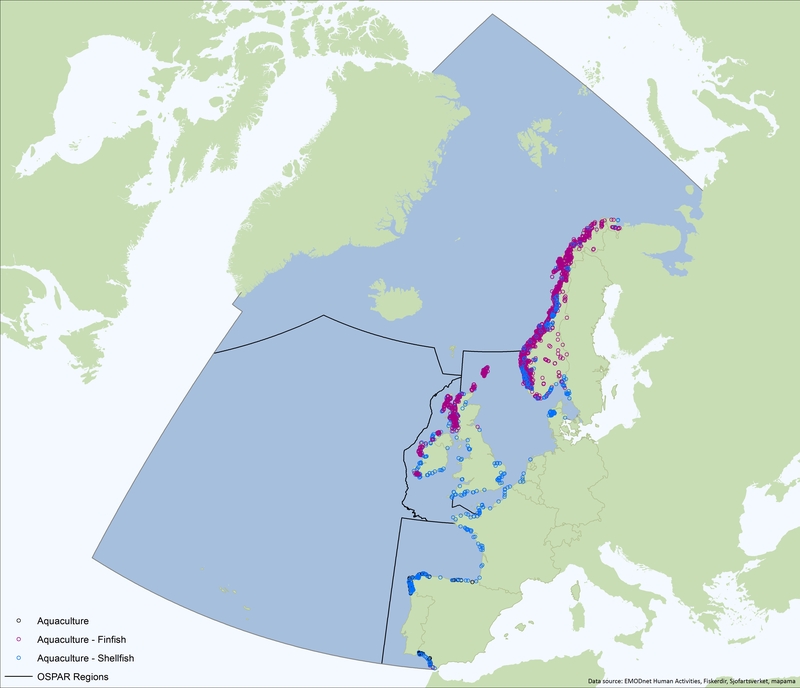 Figure 2 does not include pelagic fisheries, as a fishing intensity map was not available for the whole OSPAR Maritime Area, which would show a different spatial pattern. The picture is different for aquaculture, which is not significant on a national scale for most OSPAR countries. The locations of shellfish cultures, finfish farms and general aquaculture site (Figure 3) highlight the differences in their distribution across the OSPAR Maritime Area. Most finfish aquaculture occurs in Norway, Scotland and Ireland, whereas aquaculture for shellfish is more widespread. 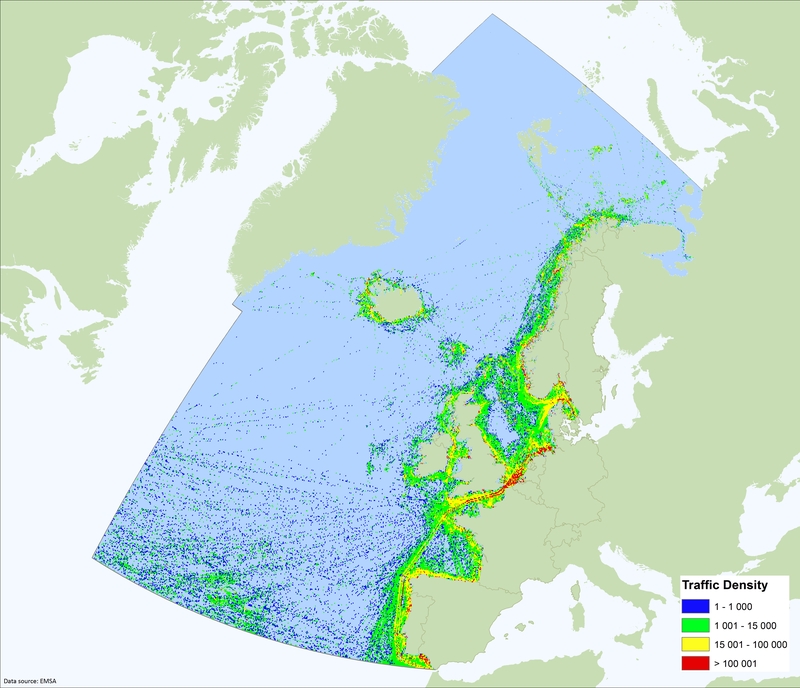 The economic activity related to shipping is widespread throughout the OSPAR Maritime Area although the highest densities of ship traffic are found in the English Channel and the southern North Sea, where the majority of Europe’s largest ports are located (Figure 3.4), and at the entrance to the Mediterranean Sea. There is also support traffic for offshore oil and gas platforms in the North Sea as well as new wind farm developments. The major ports provide a wide range of support services including shipbuilding and maintenance and are widely distributed along the OSPAR coasts (see Figure 5). 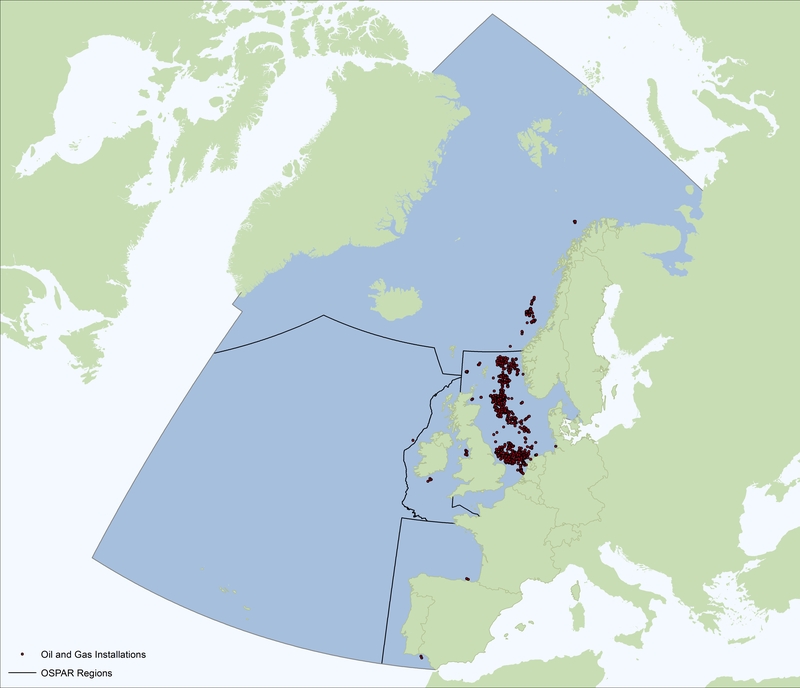 Oil and gas exploration takes place in a few OSPAR Contracting Parties, with the United Kingdom, Norway, the Netherlands and Denmark having the majority of offshore installations (Figure 6). For other countries, the number of offshore installations is relatively small. 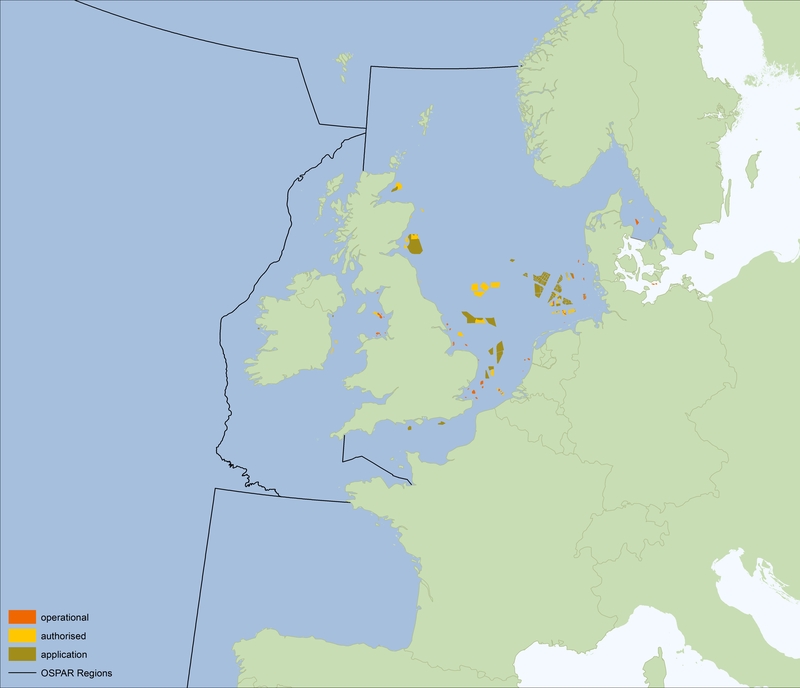 Recent years have seen a significant increase in the amount of renewable energy development in the OSPAR Maritime Area, especially in terms of wind farms, although this has mostly been focused in the Greater North Sea and Celtic seas. There are also plans for further development. These plans in the United Kingdom, Germany and Denmark contribute to the EU target of renewable energy, aiming for 20% of electricity demand to be met by renewable energy sources. There are also many areas that have been reserved for further development, meaning that this sector is likely to grow in importance in the coming years (Figure 7). Another trend is that offshore wind farms are being built and planned at locations at increasing distances from the coast, including the development of floating installations, therefore addressing some of the challenges of competing uses in the coastal zone. quantify the relationship between economic activities and pressures on the marine environment, and determine how these impact the benefits we can derive from the ocean in terms of ecosystem services. develop a uniform description of the economic activity ‘recreation and tourism’. This is an important activity both because of the economic relevance and because of its dependency on the marine ecosystem, but since it is not have a separate NACE code, it is not yet possible to collect the relevant data in a uniform manner. B. Grizzetti, D. Lanzanova, C. Liquete, A. Reynaud, A.C. Cardoso, Assessing water ecosystem services for water resource management, Environmental Science & Policy, Volume 61, July 2016, Pages 194-203, ISSN 1462-9011, https://doi.org/10.1016/j.envsci.2016.04.008.